Winter is perfect for dancing the night away in a beautiful winter themed venue complete with a skating rink and free ice skates! Enjoy an evening with friends and colleagues at VWBPE’s first networking and sponsorship social of 2019! DJ Coz OKelly will be on hand to spin some fantastic dancing tunes (again donating his time in support of VWBPE). Don your warmest, fanciest, fur-lined outfits (the one with the deepest pockets!) and take advantage of the photo ops available. Donations in both USD $ and L$ are welcome at the event, and all proceeds will go towards VWBPE 2019 programme activities, specifically in the areas of support for the conference information systems, development of video and machinima archives, live video streaming, social activities, swag bag materials for conference attendees, buildings supplies (mesh 3D objects), and graphic design. So, if you feel like supporting a very worthy part of Second Life, please hop along to the dance on January 17th! Presentation proposals should be submitted no later than Monday, January 14th, 2019. Thinkerer Award nominations are due no later than Monday, February 11th, 2019. Submissions for exhibits and immersive experiences should be submitted on later than Monday, February 11th, 2019. Please review the Exhibitor Guidelines prior to submitting an exhibit proposal. VWBPE is a global grass-roots community event focusing on education in immersive virtual environments which attracts over 2,000 educational professionals from around the world each year, who participate in 150-200 online presentations including theoretical research, application of best practices, virtual world tours, hands-on workshops, discussion panels, machinima presentations, and poster exhibits. 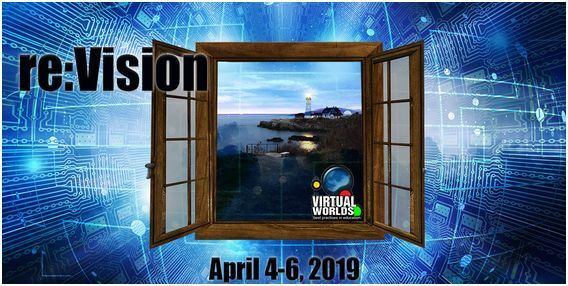 In the context of the conference, a “virtual world” is an on-line community through which users can interact with one another and use and create ideas irrespective of time and space. As such, typical examples include Second Life, OpenSimulator, Unity, World of Warcraft, Eve Online, and so on, as well as Facebook, LinkedIn, Twitter, Pinterest or any virtual environments characterised by an open social presence and in which the direction of the platform’s evolution is manifest in the community.